See full post on Houston Chronicle. 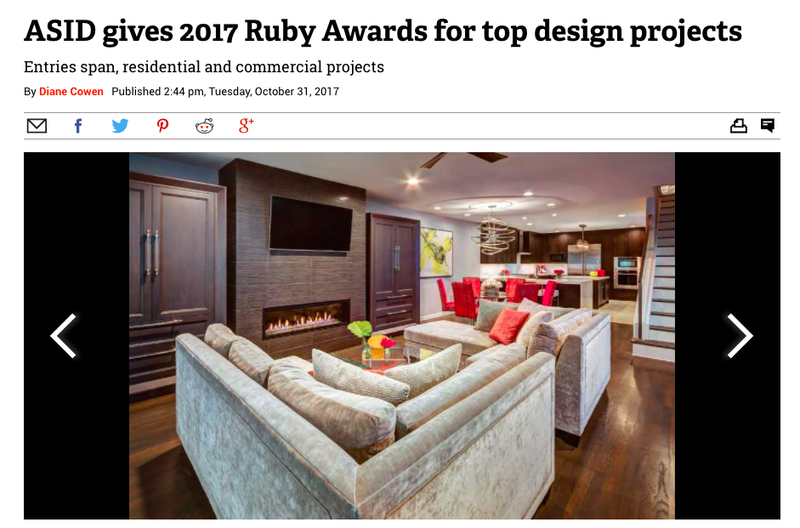 The Texas Gulf Coast chapter of the American Society of Interior Designers announced its annual Ruby Awards at its annual gala at the JW Marriott Downtown. Some 212 entries filled several categories in residential and commercial categories for ASID members, industry partners and students. The three Best in Show awards went to Missy Stewart Designs in the residential category, Bennett Design Group in commercial and Peck & Company in the industry partner category. Missy Stewart Designs' entry was for the renovation of a Montrose townhome from a dwelling of small, cluttered spaces to an open concept with room to entertain, relax and play. Bennett Design Group's commercial project involved renovating space of a large furniture dealer, turning a 20-year-old work space into an updated showroom. Peck & Company's Industry Partner project involved technology and lighting design in a project with Lucas/Eilers Design Associates and Dillon Kyle Architects. The architect, designers and a metalsmith created an oversized light fixture to span the length of the room and complement the slope of the ceiling.